Kicking off Halloween early with Erstwilder and I have finally found a wiggle skirt that works so well for me! I am super excited to have my first Halloween themed Erstwilder brooch.. I chose this one as I loved the simplicity of it and find it quite elegant, it should go with a lot of looks for the season too (and all year round in that matter). I styled the brooch a little differently than I usually would and decided to pin it to a turban, although I wasn't sure if I liked it and was on the fence about keeping it on, I decided to just go with it and ended up liking the result. 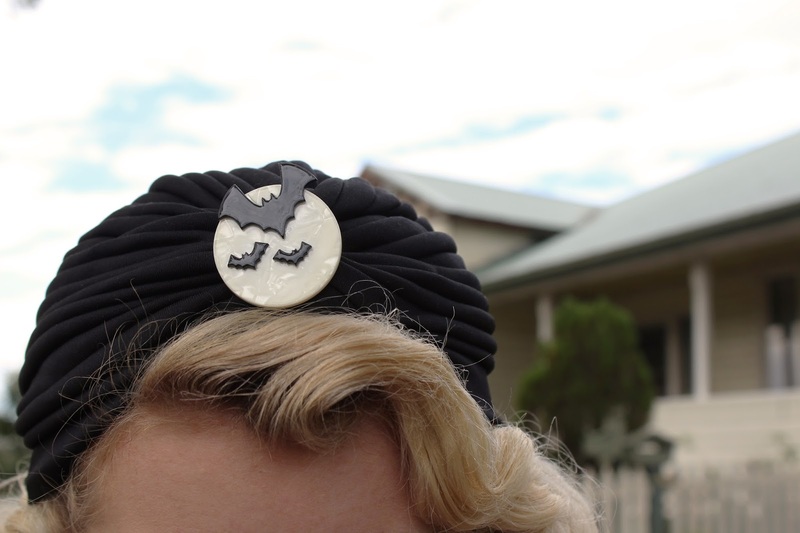 Halloween isn't huge in Australia but this is a fun way to celebrate it and what better way than to accessorise. I was a little worried taking photos in front of this house since it's a new neighbourhood (my old neighbours were used to me prancing around their driveway since they have they have great flowers this time of year lol. Max took this set and I kept telling him "Oh no, what if they come and tell me to stop taking photos in front of their house?" and he told me to just chill out they won't care and I wasn't even that close to the house, haha! 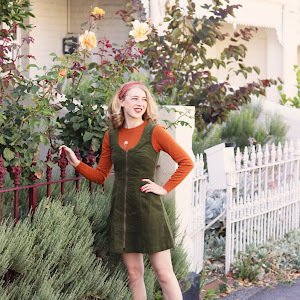 Collectif knitwear is one of my favourite things and this cardigan is no exception! It's soft to wear, has a nice cropped fit, the collar is removable and it has heart buttons yay! I went with size xs/8 and love the fit and I don't experience any gaping whilst wearing it. I love that I can remove the collar so that it goes with a variety of things in my wardrobe. This skirt is amazing, I always struggle to find a pencil skirt that has a great fit and that I feel comfortable wearing. When I received this skirt and pulled it out from the packaging I was a bit worried because it looked so tiny.. I was left thinking how will my booty fit. So naturally I tried it on straight away and I was happy to see that it has plenty of stretch and a fit perfect fit! My quest to find a really nice black pencil skirt is complete. I went with my regular size xs/8 so I am happy to have no problems or have to swap for a different size, pencil skirts seem to be a bit of a hit and miss but I am over the moon with this one. Bonus points for the adorable heart pockets!! I'm glad that they are black as it won't get in the way of styling this skirt in the future as a black pencil skirt seems like a wardrobe staple. I just wore a singlet with this cardigan and skirt as I didn't intend to take the cardi off, it probably doesn't look the greatest but I wanted to wear something simple and lightweight this particular day as it was a warm day with gusts of wind, which is why there are no stockings. I have a feeling I'll be taking my first swim of the season very soon, it is so warm today and I have already pulled my swimwear out because I'm so excited. Love this look! I also like the wiggle skirts just this summer didnt wear them so much. I will wear them more now with colder days. I do love me a cropped cardigan! So much more flattering when it finished at the waist! And your brooch placement is inspiring. I love turbans on other people but never try one myself. 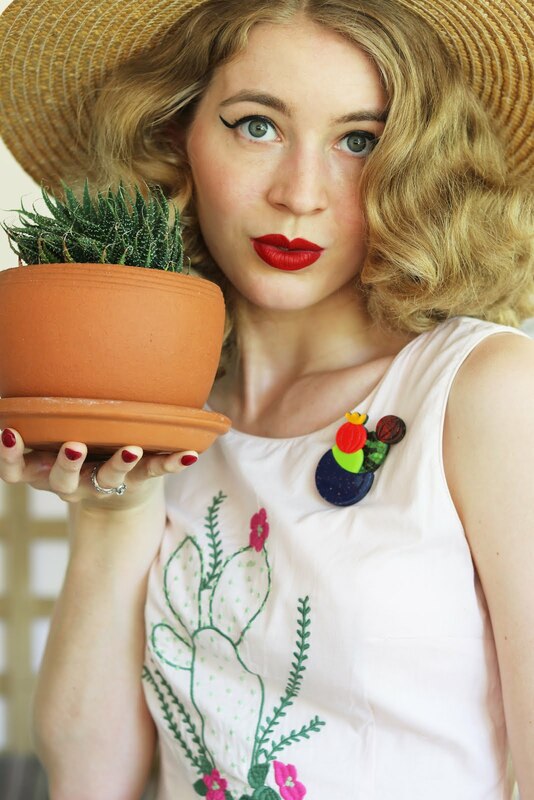 The brooch brings it to the next level of fabulousness! Magnificent outfit! That is such a great spot on which to rock a brooch, especially, I think a round one, which compliments the soft lines of a turban so nicely. 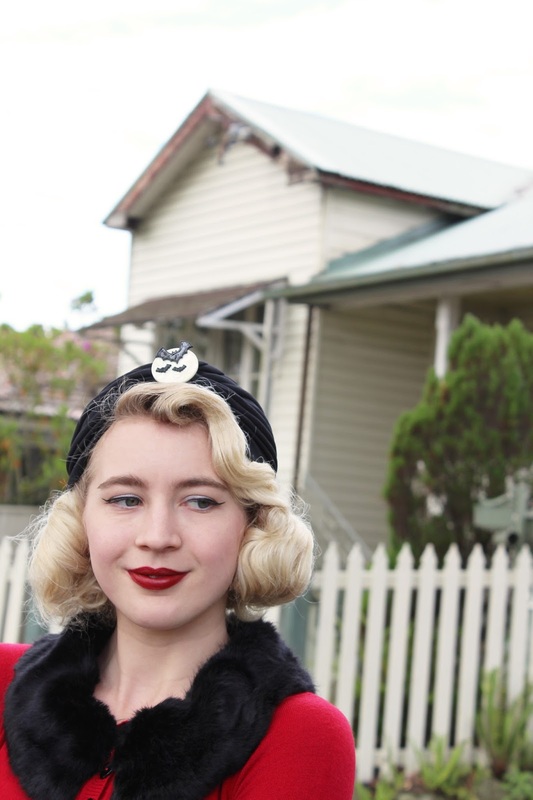 Stellar styling, dear gal! Oh that cardigan and shoes is too pretty! And I’m so obsessed with how you styled it! This outfit looks so amazing on you! I love everything, but the skrit is a real head-turner. Perfection! !